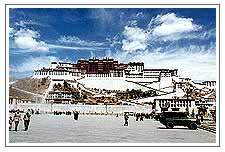 Travel to Tibet - one of the most popular tourist destinations in Himalayas region , known as 'Roof of the world'. The Buddhist monasteries, Dalai Lama, the Jokhang- a spirtual centre, the Potala - the Traditional Seat are some of the highlights of visit. Tibet, one of the extra ordinary destinations where indeed adventure lurks around every corner. Its name the "Roof of the world" is not a mere statement. 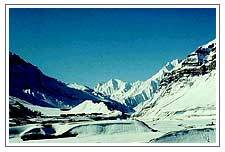 The valley bottoms of tibet are highter than the highest mountains elsewhere. Adventure on the road is never short on the beautiful Trans-Himalaya drive of over 970-kms, through four mountain passes, promising a panorama of a cultural and scenic diversity unsurpassable anywhere. The Buddhist monasteries of Drepung, once the largest; the Jokhang- a spirtual centre, and the awesome palaces of the dalai lama. Norbulingka or the Summer Palace and the Potala - the Traditional Seat are some of the highlights of visit. Adventure on the road is never short on the beautiful Trans-Himalayan drive of over 970-kms, through four mountain passes, promising a panorama of a cultural and scenic diversity unsurpassable anywhere. The Buddhist monasteries of Drepung, once the largest; the Jokhang- a spirtual centre, and the awesome palaces of the dalai lama. Norbulingka or the Summer Palace and the Potala - the Traditional Seat are some of the highlights of visit. Tibet has got the harshest climate in the world. It is cool in summer but freezingly cold in winter. The average temperature in north Tibet is subzero and winter hits in October till the coming May or June, July and August are the best time to visit the area, enjoying warm temperature, intense sunshine, beautiful scene and festive events. 1) Chengdu, Sichuan to Lhasa Direct daily flights are available between Chengdu, Sichuan, and Lhasa. You can easily get a ticket through a travel agency in Chengdu. There is also a comfortable 2-hour flight twice weekly between Chongqing and Lhasa. 2) Kathmandu to Lhasa From April to November there are 2 flights a week available between the Nepalese capital and Lhasa. Schedule air services fly from Kathmandu to Lhasa, and back every Tuesday and Saturdays with additional flights on Thursdays from July. This flight last a little over one hour and gives you a panoramic view of the Himalayas. However, individual travelers can get neither a visa nor an air ticket, which are only available to members of an organized group. 1) Xining, Qinghai via Golmud to Lhasa, this bus trip is tough going and takes a minimum of 2 nights and 3 days along the Qinghai-Tibet Highway. Although uncomfortable this is still the most popular route for travelers sticking to land transportation. 2) Kathmandu via Dram (Khasa) to Lhasa As with the Qinghai-Tibet Highway, the China-Nepal Friendship Highway is a popular route for travelers. This route brings you close to a number of famous sights, such as Shigatse, Gyantse, and the Everest Base Camp. It takes 5-7 days of traveling over the Tibetan Highlands to get to Lhasa via this route. This overland trip also subjects individual travelers to the same restrictions as access by air from Nepal. Season for Tibet is from the end March to end November each year. From end November to end March it gets too cold and flights do not operate during this period. Flights operate from first week April to end November every year. Acess to Tibet is limited to organized groups. Visa applications have to be made through a registered travel agency in Nepal. A visa for China does not entitle you to travel in Tibet.